There is no general agreement for the best surgical treatment of displaced intra-articular calcaneal fractures. The objective of this study was to estimate the outcome of open reduction and internal fixation with locked nail for treatment of displaced intra-articular calcaneal fractures. This prospective study was conducted on twenty seven patients (24 men and 3 women) and 29 calcaneal fractures were stabilized. The average age was 38.7 (18–64). 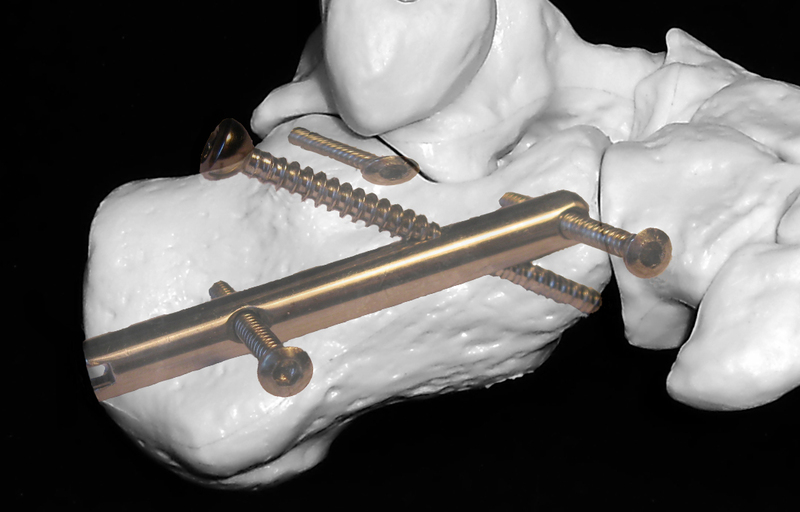 A shortened lateral approach was used to stabilize fractures using screws and a locked nail fixator for maintenance. The following radiological variables were assessed: preoperative and postoperative Böhler’s angle; calcaneal length, height, and width. The patients were evaluated by the AOFAS Ankle-Hindfoot Scale and overall results were 82.5 points at 6 month and 83.7 at 12 month follow-up. In conclusion, open reduction and internal fixation with locked nail is an effective treatment for Sanders 2 and 3 cases of displaced intra-articular calcaneal fractures. 1 Professor at the Department of Orthopedics and Traumatology № 2 at Shupyk National Medical Academy of Postgraduate Education. The management of displaced intra-articular calcaneal fractures remains a significant challenge to orthopedic surgeons and patients [1,2].These fractures are debilitating and have important long-term consequences for patients [1,3,4,5]. The most effective treatment of displaced intra-articular calcaneal fractures is still a matter of debate [1,3,6]. The adverse effects of the lateral extensile approach with plate fixation are the damage to the soft tissues and subsequent wound complications [3,7]. To avoid these soft tissue complications, several minimally invasive methods have been developed [2,7,8]. The aim of this study was to assess the clinical, radiographic, and functional outcomes of patients after locked nail osteosynthesis of displaced intra-articular calcaneal fractures. A cannulatedlocked nail and screws is presented forintraosseousosteosynthesis of the calcaneus (Figure1).Locked nailhas a diameter of8mmandfourlengths: 65mm, 70mm, 75mm,80mm.In addition, the core of the nail has threeholesforlocking screws.The two of themintroducedperpendicularto the centralaxis ofthe nail in thehorizontal plane andlocated in the headandtail sectionof the locked nail.The thirdholeisobliqueto the centralaxis ofthe nail at38ºand located in thesagittalplane.The tailof thelocked nailhasa threadedholeslotsfor introduction and attaching navigation systems.This localizationof holesandlockingscrewscreatesstabilityin the frontal, horizontal andsagittalplane. Therefore, in our opinion, presented locked nail method has several advantages. First, the stability of the posterior articular area provided via direct support by sagittal locking screw. Second, there is a possibility of closed surgery with fluoroscope control. Third, if necessary to undertake open reposition and bone grafting, lateral surgical approach can be shortened and minimized. Fourth, there is no conflict of fixative elements with peroneal tendon and lateral ankle. Fifth, intraosseous placement design reduces the risk of necrotic complications. The purpose of the current study is to evaluate the results of open reduction and locked nail fixation as a surgical treatment of the displaced intra-articular calcaneal fracture. 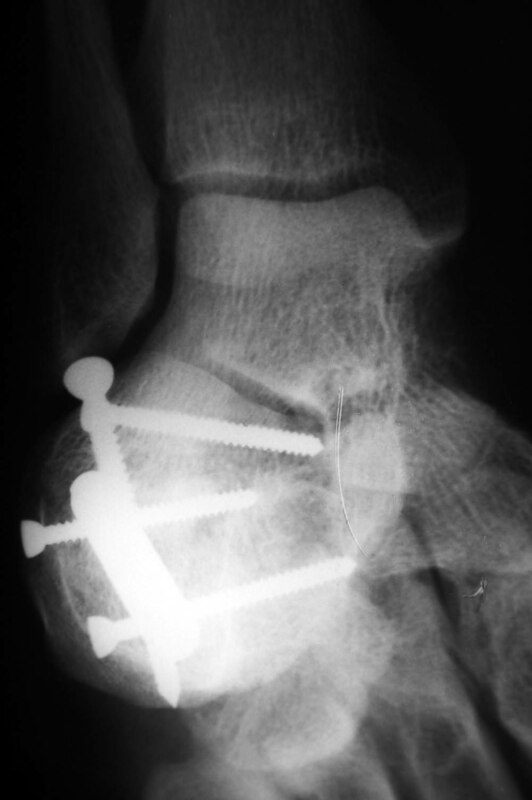 Twenty nine displaced intra-articular calcaneus fractures in twenty seven patients were stabilized with open reduction and locked nail internal fixation from May 2011 to December 2014. There were 24 men and 3 women. Their average age was 38.7±11.1 years (18–64). The right calcaneus was fractured in 13 cases and the left side in 16 cases. All cases were closed fractures. At the emergency department the lateral, axial, and Broden`s radiographs of the fractured calcaneus as well as lateral radiographs of the opposite foot were taken. A pre-operative CT scan was taken in 5 cases. Thirteen cases were classified as a joint depression type and sixteen as a tongue types according to Essex-Lopresti. There were Sanders II type fractures in 16 cases and III type in 13 cases. At emergency department of the hospital, the patient’s foot was elevated and placed in posterior plaster splint. In operating room, the patient was placed in lateral position on the side opposite the fractured calcaneus. An ankle or thigh tourniquet was applied. Spinal or peripheral regional anesthesia. In case of the open method of surgery a 6-7cm length arcuate lateral incision was performed. The incision originated behind the lateral malleolus from the point midway between the fibula and Achilles tendon, extended down then turned anteriorly reaching anterolateral corner of the calcaneocuboid joint. A full-thickness flap was developed, the peroneal retinaculum was opened and the calcaneofibular and talocalcaneal ligaments were detached from bone. As the flap was developed proximally, the subtalar joint and the sinus tarsi were exposed. After dissection of remaining capsular tissue and washing out the fracture hematoma, it was possible to inspect the posterior articular facet. Then, the fracture was reduced by elevator and surgical awl under direct visualization. Temporary fixation was performed with several Kirschner wires, the wires were driven through the subchondral region of the posterior articular facet from lateral to medial. Kirschner wires were exchanged for 3.5mm screws as needed for more stable fixation. When elevation of the fragments left a large defect in cancellous bone, autogenous bone graft was used. There were three navigation systems for locked nail osteosynthesis. The first navigation system was used for reaming channel and locked nail introduction. Two others were applied for blocking the locked nail with three screws. Firstly we started an introduction of a guide pin. It was inserted from the middle center point of the calcaneal tuber in the area below the insertion of Achilles tendon attachment and directed towards the center of the calcaneocuboid joint. After this, the X-ray control of the reposition and localization of the guide pin was held. Through aiming pin 8mm cannulated drilling to a predetermined depth and positioning of the locked nail was made. The aiming pin was put out. With the second navigation system locked nail was blocked with two 3.5mm blocking screws horizontally. With the third navigation system locking was performed in the sagittal plane through the oblique hole in the locked nail, thus achieving direct support of the posterior articular facet of the calcaneus (Figures 2,3). Temporary fixation was removed, the tourniquet was released, hemostasis obtained, wound was closured with stitches, bulky dressing was applied, and the extremity was elevated. In the postoperative period, additional immobilization was not applicable, limb elevation and antibiotics were given for 5 days. It may be possible to perform a closed reduction of the fragments and introduce a locked nail through 1 cm cut and cut points for blocking screws using fluoroscopy. The patients were followed up for 6-12 months after the surgery. On the radiographs and CT scans, we evaluated: Böhler’s angle; calcaneal length, height, and width. Figure 1 Schematic image of the intracalcaneal location of the locked nail and screws. 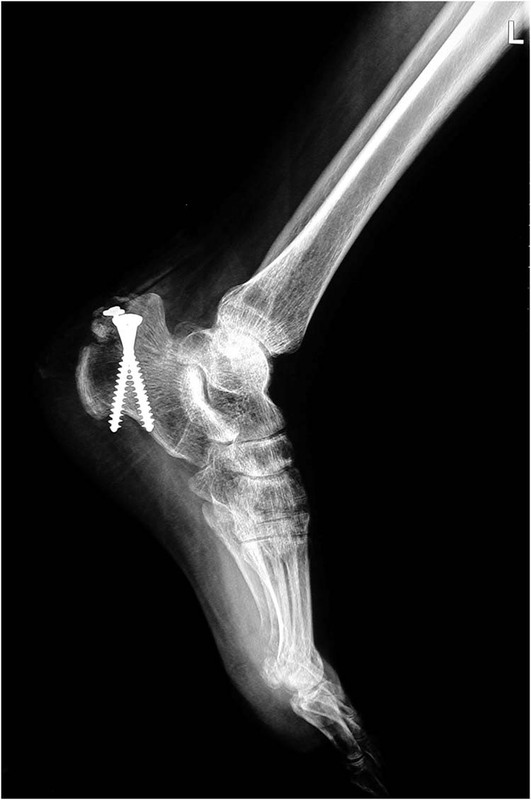 Figure 2 Lateral radiograph of the fixed calcaneal fracture with locked nail and screws. 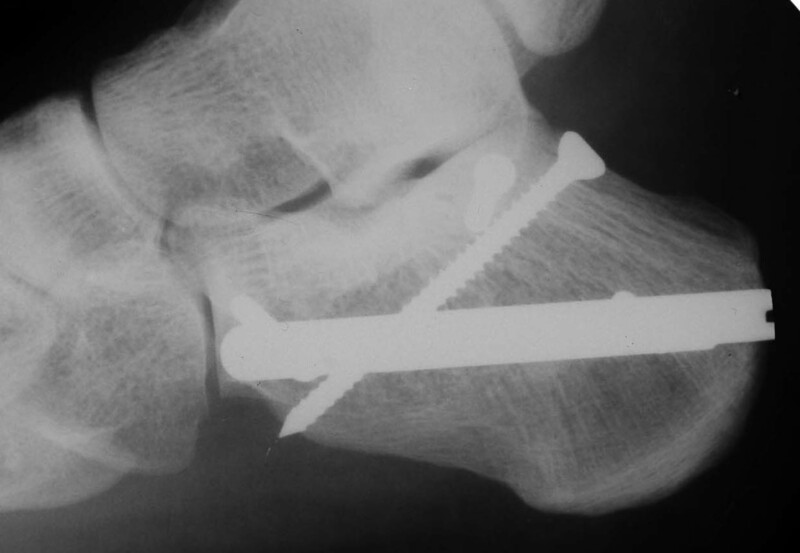 Figure 3 Broden’s radiograph of the fixed calcaneal fracture with locked nail and screws. The severity of subtalar arthritis was graded based on the radiographic appearance according to Paley . The patients were evaluated by a generally accepted AOFAS Clinical Rating System, the Ankle Hindfoot Scale for calcaneal area (100 points total, 90–100 points, excellent; 80–89 points, good; 70–79 points, fair, less than 70, poor). Continuous variables (patient statistics and radiographic variables) in the form of the mean and standard deviation were summarized. Categorical variables were expressed by using frequency and percentage. Student’s t-test was used to compare the differences among preoperative, and postoperative radiographic measurements. The level of significance was set at p < 0.05. All statistical analyses were performed using MS Excel 2003 software. One patient was lost to follow up. Average AOFAS score at 6 month follow up was 82.5±4.8, there were three excellent (10.7%), eighteen good (64.3%), six fair (21.4%), and one poor (3.6%) results in 28 cases. For simplicity, the excellent and good cases were rated satisfactory (75.0%), and the fair and poor cases were rated unsatisfactory (25.0%). At 12 month follow up we received four excellent (14.3%), twenty good (71.4%), three fair (10.7%), and one poor (3.6%), satisfactory 85.7% and 14.3% unsatisfactory results. The mean value was 83.7±5.6. At both follow up there was no or slight pain at the lateral aspect of heel. It should be noted that this type of pain was the main complaint of the majority of patients after plate osteosynthesis. Pain that was related to subtalar joint arthrosis had been noted in eleven patients. There was implant irritation pain in retrocalcaneal region in five patients. It was due to the locked nail projection beyond the shape of calcaneal bone which led to implant removing after consolidation of the fragments. No patients showed a normal (as at opposite leg) range of motion of the subtalar joint even in case of anatomic restoration of articular surface and lack of arthrosis at follow ups. A mild restriction at subtalar joint movement was in seven cases, moderate in twenty one cases, marked restriction in one patient. In one patient it is planned to perform a subtalar arthrodesis to consistent walking pain despite good radiographic parameters. The average preoperative Bohler’s angle was 7.5º±12.2º. (range from -18.3º to 27.9º), and the average postoperative angle was 29.7º±5º (range 22.2º–40º). The mean calcaneal height before operation was 44.0±4.5mm, at follow up 51.2±4.1mm. The mean calcaneal length at preoperative measurements was 78.0±14.9mm and at follow up it was 80.7±6.3mm. The calcaneal width before operation was 47.2±4.5mm and after surgery was 41.4±4mm. The mean preoperative Böhler’s angle and calcaneal height were significantly increased (P < 0.05) at postoperative follow-up, whereas the mean preoperative calcaneal width was decreased (P < 0.05). The reduction was graded as nearly anatomical (less than 2 mm residual articular step-off and satisfactory overall alignment) in 26 (89.7%). The posterior subtalar joint was assessed for subtalar arthritis at 12 month follow up and have been received grade 0 in 23 (82.1%), grade 1 in 4 (14.3%), grade 2 in 1 (3.6%). In the structure of lesions of the musculoskeletal system calcaneus fractures account for 1-2 % of all fractures of the skeleton, and 60 % of all fractures of the foot. Moreover, the vast majority of these fractures occur in the active working age, resulting in significant economic losses [1,2]. Depending on the nature of the damage and energy of the injury there are various types of fractures of the calcaneus. But the most unfavorable is intraarticular, which leads to damage and arthrosis of the talocalcaneal joint. Heel widening results for calcaneofibular ligament impingement syndrome, compression tenosynovitis of the peroneal tendon. Loss of calcaneal height and shape leads to weakening of the gastrocnemius-soleus muscles function, varus deformity of the foot, ankle contractures [1,2,4,7]. The many ways of conservative and surgical treatment of fractures of the calcaneus were reported [1,2,4,8]. The existing conservative methods do not provide anatomic reposition and stable fixation. A long-term immobilization of the foot significantly prolongs rehabilitation and worsens outcome. Therefore, preference is given to the methods of osteosynthesis by plates, screws, needles, and external fixators [1,2]. The majority of surgeons apply a wide surgical exposure for open reposition and plate osteosynthesis, which provides the opportunity for anatomic reduction and rigid internal fixation of the fragments . At the same time the subcutaneous location of a fixative device, soft tissue deficit, additional trauma and significant neurovascular violations by surgical exposure, adverse microbial environment in the 24 % -32% causes the appearance of purulent- necrotic complications [3,7]. In this regard, the search continues for methods of minimally invasive surgery: closed osteosynthesis with arthroscopic control, balloon calcaneoplasty, arthrodesis through minimal surgical approach [2,4,8]. There were first foreign reports of minimally invasive osteosynthesis for fractures of the calcaneus with locked nail . But the works in this direction have been few and in Ukraine have not yet carried out . The present study was conducted with the purpose to delineate the role of locked nail osteosynthesis in the management of intraarticular calcaneal fractures. The surgical treatment with locked nail fixation of the calcaneal fragments has proved to be simple, easy, safe, and adequate for management of displaced intra-articular calcaneal fractures. Presented locked nail method of has several advantages: the stability of the posterior articular area provided via direct support by sagittal locking screw, there is a possibility of closed surgery with fluoroscope control, in case of open reduction and bone grafting, lateral surgical approach can be shortened and minimized, there is no conflict of fixative elements with peroneal tendon and lateral ankle, reduced the risk of wound necrotic complications. It is need to continue investigations in presented method of intracalcaneal locked nail osteosynthesis to improve outcomes for patients with articular fractures of heel bone, improve quality and reduce the invasiveness of surgical treatment of such patients. Avulsion fractures of the calcaneal tuberosity are rare extra-articular injuries that usually occur indirectly from forced ankle dorsiflexion particularly in elderly females. Direct trauma to the calcaneal tuberosity is an infrequent cause particularly in young adults. Failure to treat these injuries urgently with open reduction and internal fixation may result in soft tissue complications. We review the literature and present a case report in which soft tissue complications occurred after a direct traumatic avulsion fracture of the calcaneal tuberosity occurred due to delayed treatment. Key words: Calcaneal avulsion fracture, calcaneal tuberosity, heel fracture. We present a male patient who presented with avulsion fracture of the calcaneal tuberosity due to direct trauma to the calcaneal tuberosity and subsequently developed severe soft tissue complications due to delayed treatment. The purpose of this report is to emphasize the comparative rarity of tuberosity avulsion fractures of the calcaneus particularly those that are due to direct trauma and to highlight that this subset of calcaneal fractures should be treated urgently to avoid soft tissue complications. A 37 year old male patient was assaulted on his left heel with a steel rod 7 weeks before presenting to our center. He had sustained a closed injury, which was initially treated with a plaster of Paris (POP) cast. He then complained of persistent pain inside the plaster cast. Upon removal of the cast, an open wound was identified. The wound was dressed as an outpatient for about 6 weeks before referral. He presented to us with a septic wound, heel boss deformity and a visible bone fragment through the wound. (Fig. 1) He was unable to plantarflex the ankle against resistance. Plain radiograph examination revealed an open beak type fracture or avulsion fracture of the posterior calcaneus as shown in figure 2. Consent was obtained for photographs and documentation. Figure 1 Left posterior heel boss deformity and a wound with a bone exposure. Figure 2 Pre-operative radiographs of an open beak type fracture of posterior calcaneal tuberosity. Wound cultures revealed staphylococcus aureus, which was sensitive to cloxacillin. The sepsis was treated for 2 weeks with suction drainage and intravenous cloxacillin until the wound was healed. During this time, the ankle was immobilized with an ankle orthosis with a limiting upstop. After the wound had healed and blood markers indicated that the infection was eradicated, open reduction and internal fixation of the fracture was performed. Post-operative radiograph is shown in figure 3. After two weeks the surgical wound was healed and a below knee cast was then applied in plantarflexion for 8 weeks. Figure 3 Post-operative radiograph following open reduction and internal fixation of the avulsion fracture. After 12 weeks, he was allowed to fully weight bear when there were signs of bone union radiographically. He was then referred to physiotherapy for rehabilitation with an emphasis on Achilles tendon stretching. 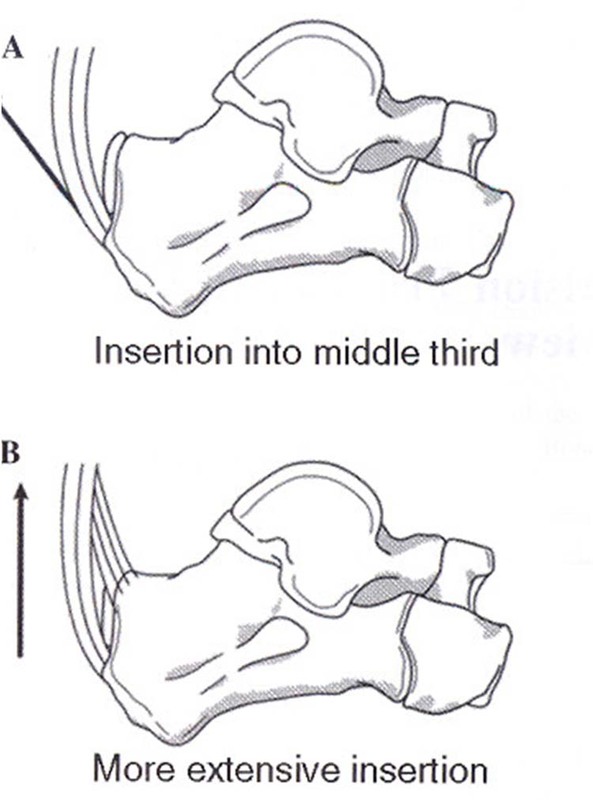 Figure 4 Different anatomic insertions of the Achilles tendon. (Reprint permission granted by Beavis, et al., and Foot & Ankle International Publishers6). The posterior skin of the heel is thin with precarious blood supply. The ankle initially assumes a position of maximal plantarflexion as in falling from a height. In this position the force from a loaded Achilles tendon is transmitted to the calcaneal tuberosity, and to the plantar fascia by a series of highly oriented trabeculae. [6,16] When the gastrocnemius-soleus complex contracts which occurs after a low impact fall, sudden forced dorsiflexion occurs, pulling the tendon Achilles and causing avulsion of a fragment of bone. The size of the avulsed fragment will depend on the position of the foot during impact. During pronation, the whole tuberosity is involved whereas only a part of the tuberosity is involved during supination. The superior fragment is displaced upwards, presumably due to the pull of the Achilles tendon, and rotated so that the postero-superior border moves upwards and the postero-inferior edge moves posteriorly, compressing the thin skin at the back of the heel. The fragment hinges on its anterior apex as it displaces so that a fracture, which had minimal displacement anteriorly, is often significantly displaced posteriorly, potentially giving rise to a heel boss, pressure necrosis and formation of an ulcer as in our case. This phenomenon explains the disability resulting from so-called ‘undisplaced’ fractures. Mechanisms of injury and possible etiologies has been described as shown in Table 1. The risk factors that may contribute to calcaneal tuberosity fractures are described in Table 2. Table 1 Various mechanisms of avulsion fracture injury associated with possible etiologies as described in the literature. Table 2 Risk factors that can contribute to calcaneal avulsion fractures as described in the literature. Direct trauma to the calcaneal tuberosity, as in our case, is an infrequent cause of this type of fracture. [4,14,17,18] Malgaigne described avulsion fractures of the tuberosity of the calcaneus as early as 1843. Management and treatment is often dictated by the age, health and functional demands of the patient as well as degree of separation of the fracture fragments. With minimal or no displacement (≤1 cm), conservative treatment either in an equinus cast or a functional boot has yielded satisfactory results. This is accomplished by treatment in a short-leg non-weightbearing equinus cast for 6 to 12 weeks until radiographic union is confirmed. The patient is then gradually brought out of equinus and weight bearing is increased. 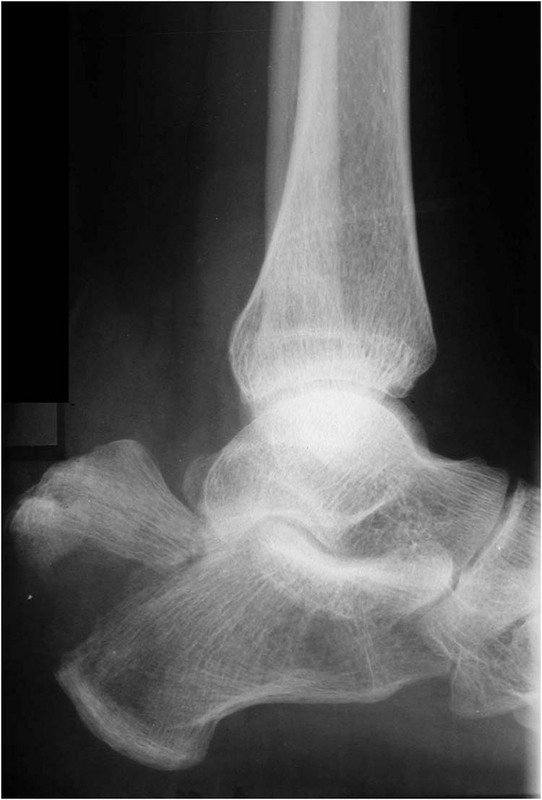 Complications after non-operative treatment of calcaneal tuberosity fractures include: skin necrosis, Haglund’s deformity and loss of plantarflexion power. In displaced fractures, skin necrosis as a result of pressure from the underlying fragment is significant cause for concern. Methods of fixation include suturing of the avulsed bone fragment, suture anchors, tension band wiring and screw fixation as performed in the present case report. [6,7,9] The choice of technique depends on the size of the avulsed bone fragment and the degree of osteopenia. Screw fixation has been advocated; however it should be kept in mind that most of these fractures are insufficiency fractures. Screw purchase in the bone is poor and healing takes longer to occur. Protheroe drew attention to the risk of pressure necrosis of skin overlying displaced fragments and he advocated the need for early operative correction to prevent skin damage. Lowy also described one of his four cases he reported in 1969 which was marred by a persistent sinus which did not heal for 9 months after surgical intervention. Lyngstadaas made mention of the fact that the Achilles tendon may be damaged when it runs over the sharp fragments of an avulsed bone in a poorly repositioned beak. 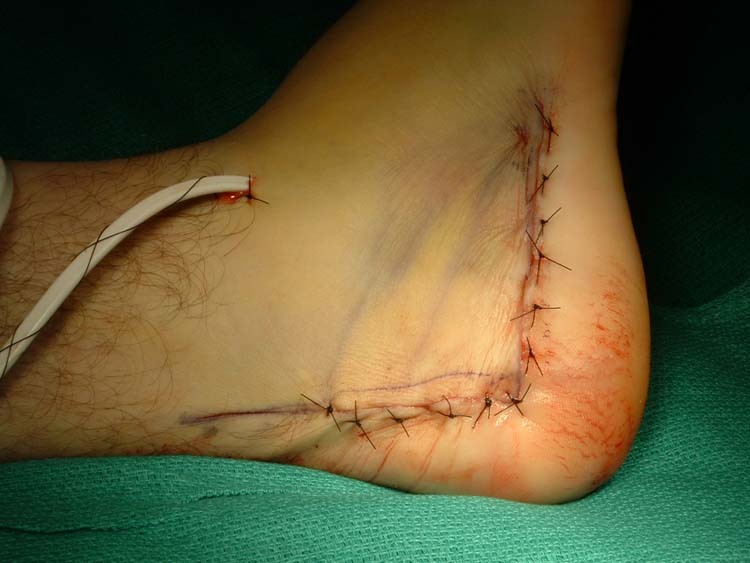 He advocated surgery for this type of soft tissue threatening fractures although necrosis developed on the incision wound of one of the two patients he treated surgically due to what he described as poor circulation. 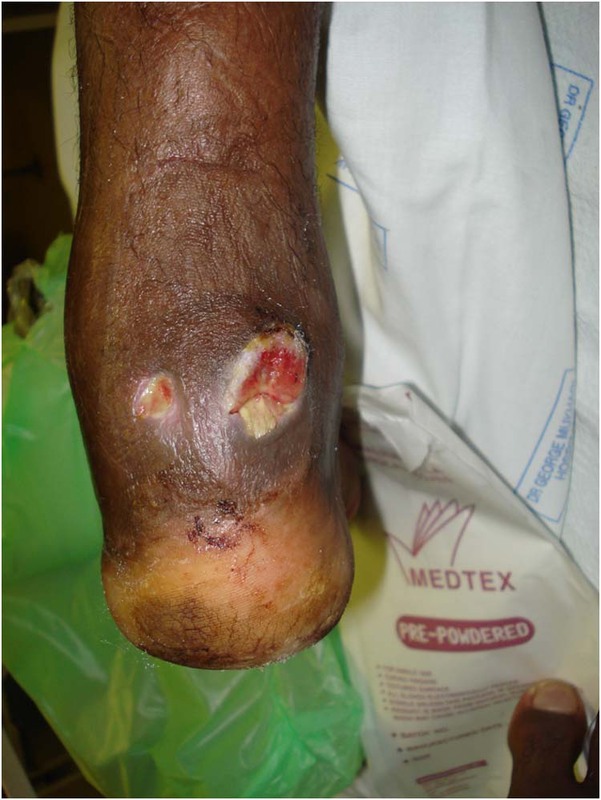 Review of this literature supports that a delayed approach in avulsion fractures can lead to skin necrosis and severe wound complications. The initial evaluating physician must therefore recognize these signs to get these injuries treated early. Signs of skin at risk at presentation are blanching and lack of capillary refill. These are followed by overt skin necrosis, tissue breakdown and infection as in our case. All the complications in our case may have been prevented if more expedient treatment was given on presentation at the referral hospital. Tuberosity avulsion fractures are rare, particularly those due to direct trauma. They represent a subset of calcaneal fractures that should be addressed urgently to avoid complications, particularly skin breakdown and subsequent sepsis. The initial evaluating physician must recognize the signs of skin at risk so that treatment can be offered urgently. Non-operative treatment has been shown to yield poor results. The golden standard is early surgical intervention when indicated. 1. Rothberg AS. Avulsion fracture of the os calcis. JBJS 1939 21A: 218-220. 2. Heckman JO. Fractures and dislocations of the foot. In: Rockwood CA, Green DP, Bulchoz RW, Heckman JO (editors). Rockwood and Greens Fracture in Adults. Volume 2, 4th ed. Philadelphia: Lippincott-Raven 1996: 2332-2333. 4. Cooper D.E, Heckman J.D. The heel of Achilles: Calcaneal avulsion fracture from a gunshot wound. American Orthopaedic Foot & Ankle Society 1989 9 (4). 5. Court-Brown CM, Koval KJ. The epidemiology of fractures. In: Bulchoz RW, Heckman JO, Court-Brown CM (editors). Rockwood and Green’s Fracture in Adults. 6th ed. Philadelphia: Lippincott Williams & Wilkins 2006: 95-144. 6. Beavis RC, Rouke K, Court-Brown C. Avulsion fracture of the Calcaneal Tuberosity. Foot Ankle Int 2008 29: 863-866. 7. Robb CA, Davies MB. A new technique for fixation of calcaneal tuberosity avulsion fractures. Foot Ankle Surgery 2003 9 (4): 221-224. 9. Sqiures B, Allen P.E, Livingstone J, Atkins R.M. Fractures of the tuberosity of the calcaneus JBJS 2001 83B: 55-61. 10. Hess M, Booth B, Laughlin RT. Calcaneal avulsion fracture: complications from delayed treatment. Am Journ Emergency Medicine 2008 26 254: El-254e4. 11. Lowy M. Avulsion fractures of the calcaneus. JBJS 1969 51B 494-497. 12. Protheroe K: Avulsion fractures of the calcaneus JBJS 1969 51B: 118-122. 13. Bierwag K. Avulsion fractures of the calcaneus International Surgery 1970 54: 424-427. 14. Lyngstadaas K: Treatment of Avulsion fractures of the Tuber calcanei. Acta Chir Scanda 1971 137: 579-581. 15. Snow SW, Bohne WHO, DiCarlo E. Anatomy of the Achilles tendon and plantar fascia in relation to the calcaneus in various age groups. Foot Ankle Int 1995 16 (7):418-421. 16. Milz S, Rufai A, Buettner A, Putz R, Ralphs JR, Benjamin Met al: Three-dimensional reconstructions of the Achilles tendon insertion in man. J Anat 2002 200:145-152. 17. Amer O, Lindholm A. Avulsion fracture of the os calcaneus. Acta Chir Scand 1959 117: 258-260. 18. Essex-Lopresti P. Mechanism, reduction technique, and results in fractures of the os calcis. Br J Surg 1952 39: 395-419. 19. El-Khoury GY, Kathol MH. Neuropathic fractures in patients with diabetes mellitus. Diagnostic Radiology 1980 134: 313-316. 20. Kathol MH, El-Khoury GY, Moore TE, Marsh JL. Calcaneal insufficiency avulsion fractures in patients with diabetes mellitus. Musculoskeletal Radiology 1991 180 (3): 725-729. 21. Martini F, Kremling E, Sell S. Bilateral a traumatic avulsion fracture of calcaneal tubercle in osteomalacia during fluoride therapy. Acta Orthop Scand 1999 70(1): 91-92. 22. Rowe CR, Sakellarides H, Freeman P, Sorbie C. Fractures of the os calcis. A long follow-up study of 146 patients. JAMA 1963 184: 920. 23. Schepers T, den Hartog D, Abida Z. Posterior capsular avulsion fracture of the Calcaneus: An Uncommon Alvusion Fracture. J Foot & Ankle Surgery 2007 46 (5): 409-410. 24. Brunner CF, Weber BG. Special Techniques in Internal Fixation. Belin: Springer-Verlag; 1982, pp16-53. 25. Dieterle JO. A case of so-called “open-beak” fracture of the os calcis. JBJS 1940 22A: 740. 0204. Tel: 012-521 4005, Fax: 012-521 4029, E-mail: mpho@ul.ac.za. 1 Registrar, Department of Orthopaedics, Dr George Mukhari Hospital, Pretoria. 2 Consultant, Dr George Mukhari Hospital, Pretoria. 3 Professor and Head of Department Orthopaedics Surgery, University of Limpopo (Medunsa Campus).